Between the sound of bagpipes and students singing “Seasons of Love” from the Broadway musical Rent, Lisner Auditorium was full of song as students and faculty from the George Washington University (GW) School of Medicine and Health Sciences (SMHS) entered and settled in for the MD graduation ceremony on Sunday, May 20. 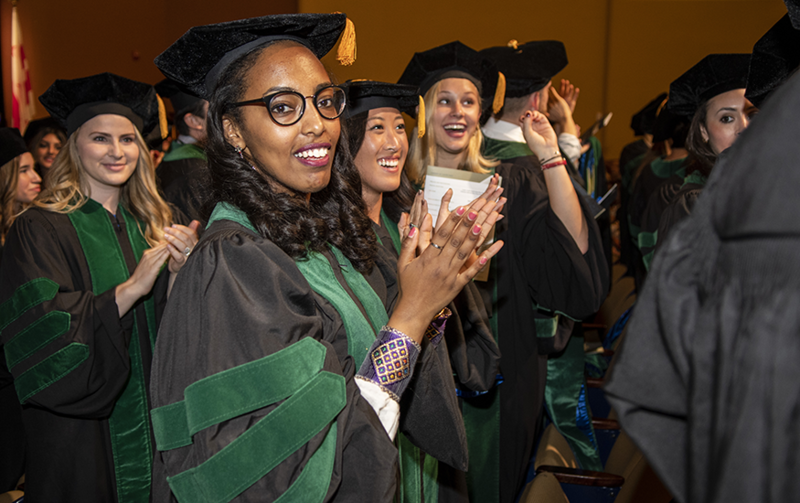 In their last moments as medical students, the Class of 2018 heard from Griffin P. Rodgers, MD, FEL ’89, director of the National Institute of Diabetes and Digestive and Kidney Diseases. Rodgers shared the five tips that he has cultivated over time with the graduates. The first he shared was that “what you learn tomorrow is even more critical than what you know today.” Rodgers pointed to the technological advances, such as artificial intelligence and precision medicine, which have further pushed many industries, including medicine, into the future. He made his point by acknowledging the emphasis that the GW curriculum places on social determinants of health and how it challenges students to think about how they can impact them. Before leading students in the Hippocratic Oath and closing the ceremony, Jeffrey S. Akman, MD ’81, RESD ’85, vice president for health affairs, Walter A. Bloedorn Professor of Administrative Medicine, and dean of SMHS, addressed the audience with a few remarks. To answer this, he highlighted three important words in the phrase: joy, healing, and care. “Joy reflects that the physician is grateful for the healing experience,” Akman explained.